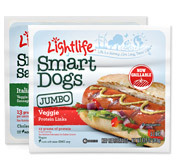 Lightlife is a Massachusetts company, founded in 1979, that sells a full line of ready-to-eat vegetarian prepared foods. Their products are sold in the refrigerated and frozen food section of health food stores, and supermarkets such as Whole Foods Market and Trader Joe’s. If you’re currently eating meat, and would like to cut back, Lightlife products will help you break the meat-eating habit, and reduce your cholesterol intake. For more information visit the Lightlife website. Posted on May 2, 2013, in Food, Recommended Products and tagged frozen entrees, tempeh, vegetarian food, veggie hot dogs. Bookmark the permalink. Leave a comment.